HeCareth Ministry is a family Enrichment Ministry based in Baton Rouge, Louisiana. We have DVD’s CDs and books that will help you improve your marital relationship. The DVD’s sell at $15 apiece, however we have a special offer for our registered guest. A package of 12 DVDs sells for only $100.00 and a package of 4 DVDs for only $50.00. CLICK HERE to puchase the 12 Pack of DVDs via PayPal. CLICK HERE to purchase to purchase the 4 Pack of DVDs via PayPal. This is designed to help you start a marriage bible study in your home or church. As you reach out to other people, God will bless your family as well. At the end of each DVD, people can ask questions which can be sent to us via email for onward transmission to Dr. Ruby Ibekwe. We can then help answer these questions. This will help you prepare for your next bible study. AS you can see, these charges are just to help us offset some of the expenses incurred while making the DVDs. Therefore if you feel led to donate more to the ministry please feel free to do so. When you decide to be a blessing to other families despite your own problems, it touches the heart of God to move in your own family. The book you've been waiting for is here. 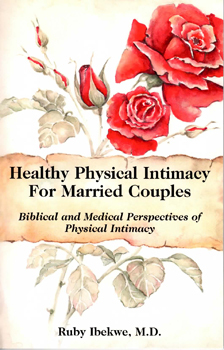 "Healthy Physical Intimacy for Married Couples"
Many couples are facing challenges in this area of physical intimacy (sexual relationship) and do not know how to find a solution due to neither ignorance or the embarrassment attached to this issue. This book will help you overcome the common obstacles and prepare you to help other couples. Do not die in silence. Order Your copy today. 2. Print out order sheet and fill it out. Please add $2.50 to your order for shipping and handling. If you have a question about our ministry or would like to order DVDs, you may contact at the number below. May God bless you.